I am late this week! I meant to have this up yesterday, but better late than never right? I have for you the third collection from Gamer Gloss. This is probably my favorite inspiration yet. This collection is inspired by the game Mario Kart. Well Mario Kart was and is to this day one of my favorites. So of course I had to pull out my N64 and pose with some Mario-ware! Lets get on to the colors! 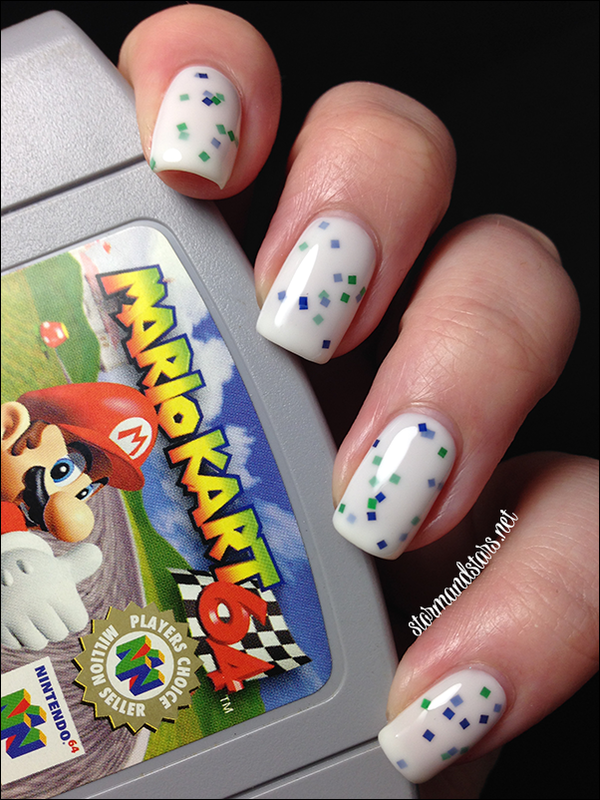 The Other Brother is inspired by the character Luigi and is a white crelly lacquer with small green and blue square glitters throughout. I used two coats of The Other Brother layered over a base of Jolie Polish, White Crelly (my choice for a base of allllll white crelly lacquers!) 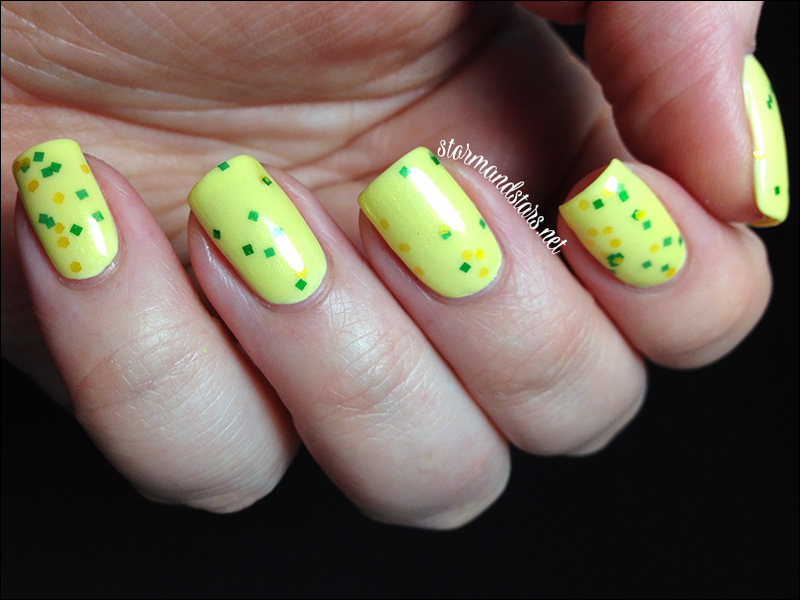 I topped it with Fat Lacquers Drive Thru Topcoat which is quickly becoming my go to topcoat for swatching. 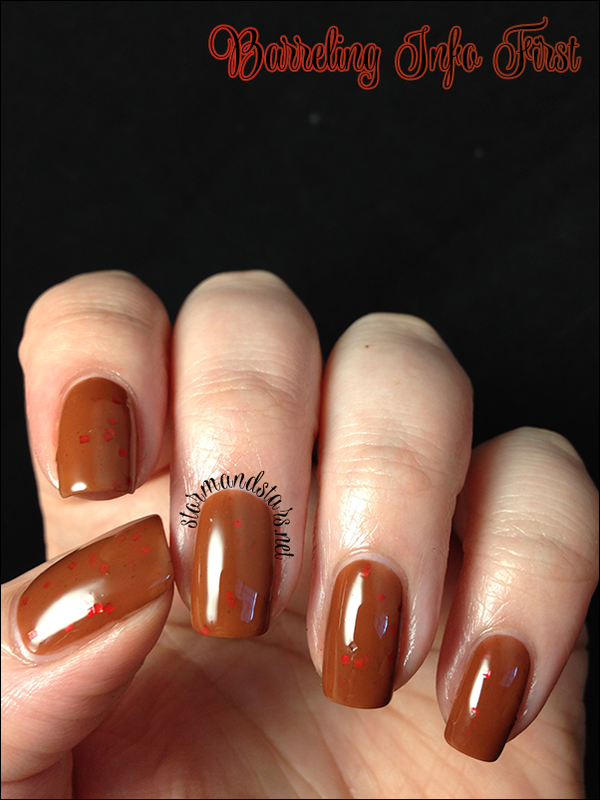 This lacquer has a great formula and I really love it's simplicity. 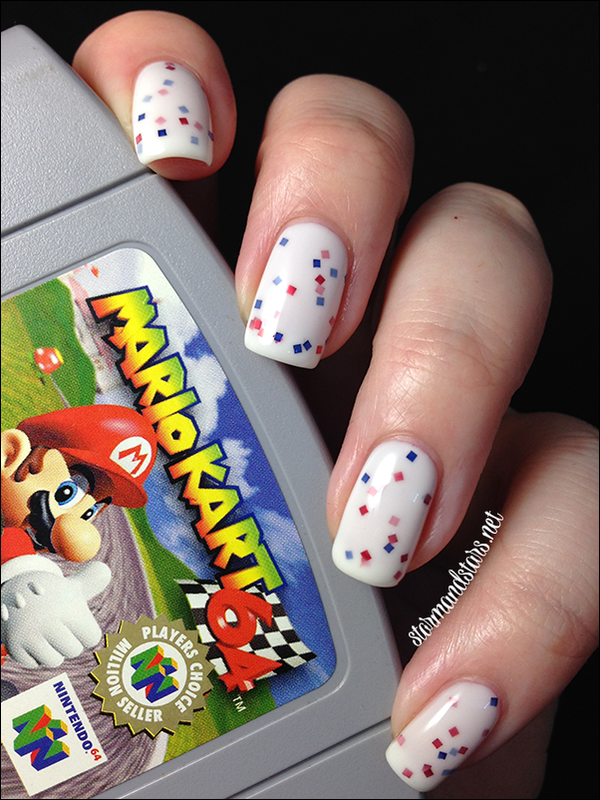 I couldn't leave out some photos with my beloved N64 Mario Kart cartridge haha! For the boss of this collection, we have Koopa King. Koopa King is inspired by the king himself, Bowser, the big boss. 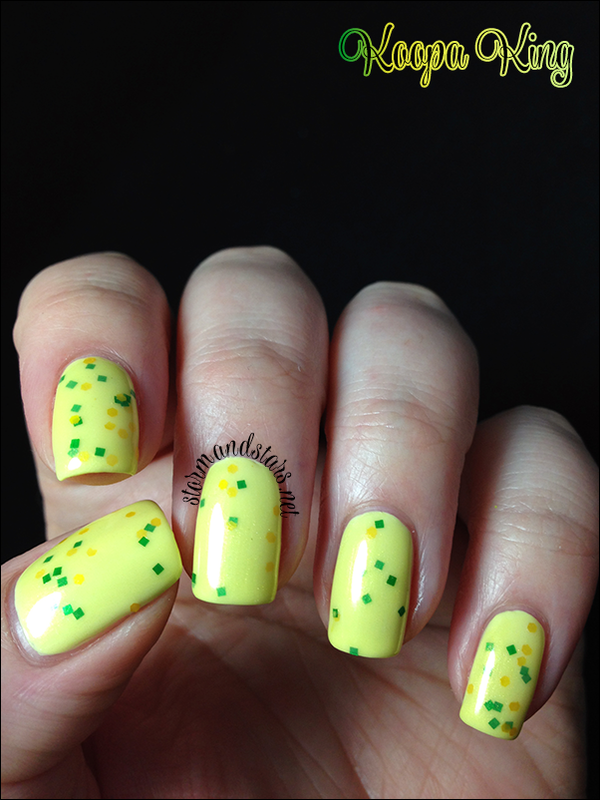 This sheer yellow shimmer lacquer is loaded with green and yellow glitters. 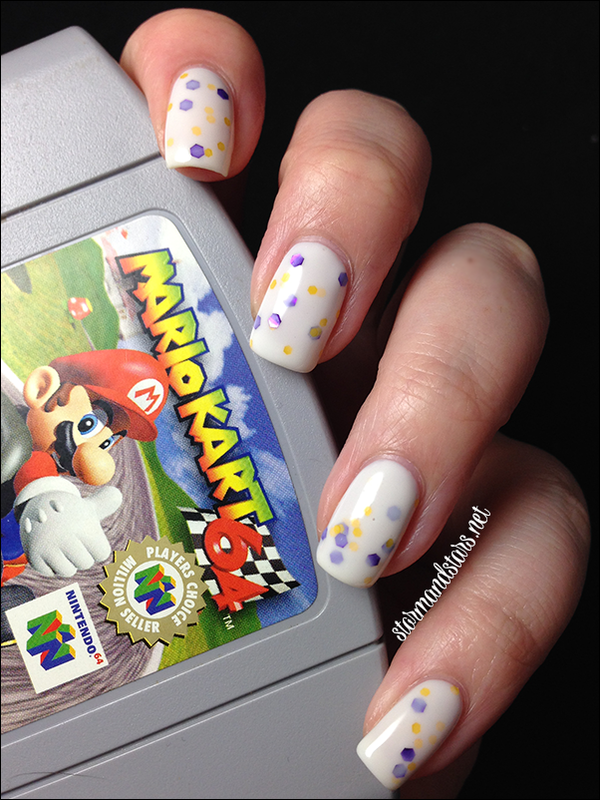 I started this mani with two coats of Cult Nails New Day, they added three coats of Koopa King and a coat of shiny topcoat. The formula was sheer but lovely. I like how soft the base color is and then how the yellow and green glitters really punch through it. Very Bowser indeed. Next up is Greed for Speed. 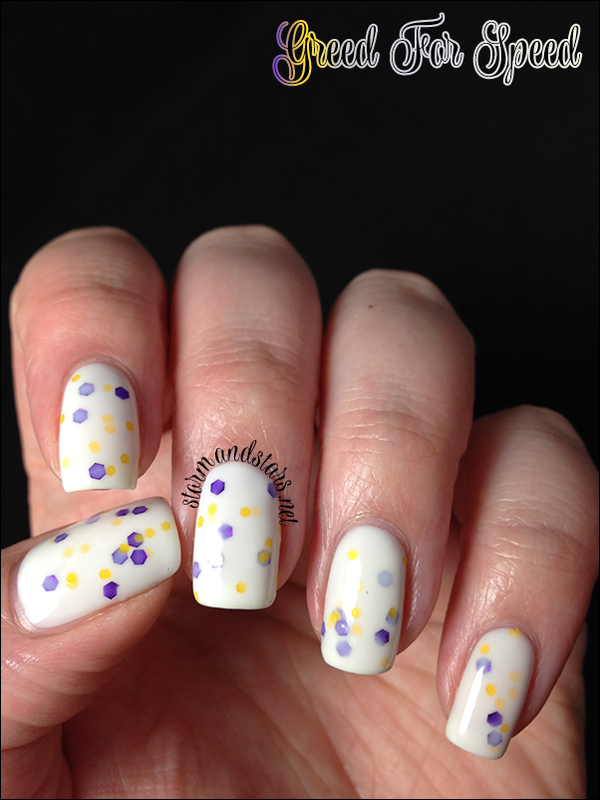 Greed For Speed is another white crelly based lacquer loaded with large purple and medium yellow hexes. This one is inspired by Wario. I layered two coats of Greed for Speed over a base of Jolie Polish White Crelly and topped the whole mani off with a coat of Drive Thru topcoat. I found this to be thinner than the other crellies, but still ok to work with. I like the contrasting colors in this one and it would be really great for spring! Barreling into this post now is Barreling Into First. Barreling Into First is inspired by the one and only Donkey Kong. 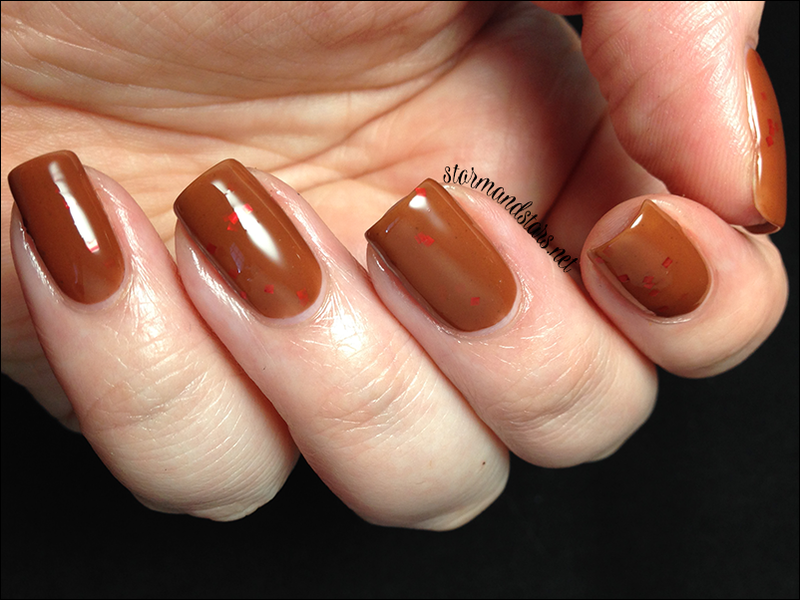 This lacquer is a brown jelly base with red glitters. 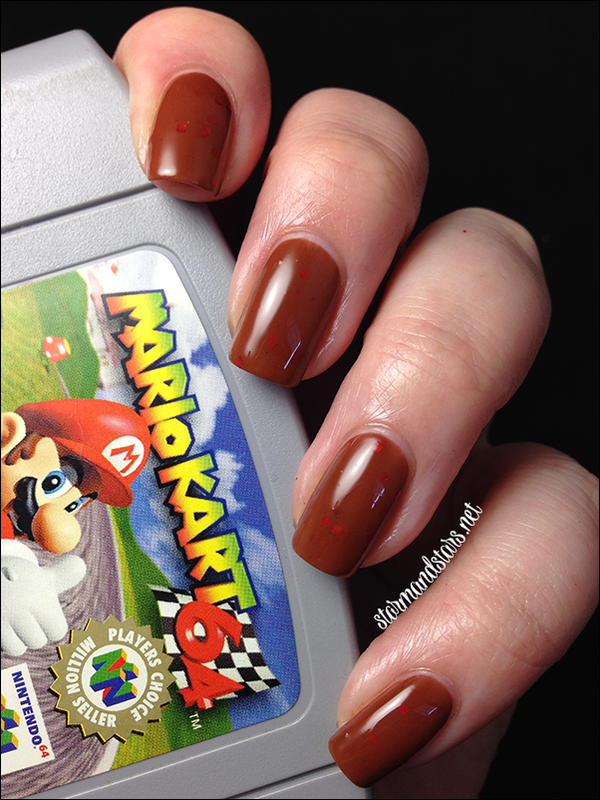 I used two coats of Barreling Into First for this manicure and I added a coat of shiny topcoat to finish it off. I found the formula slightly thin and there was some unmixed pigment in my first coat that I could see. Once I got through the second coat I couldn't see the unmixed pigment and it looked very smooth. Brown isn't my color, but if you're a lover of this shade this is a good one! Eggceleration is coming up next for this collection. 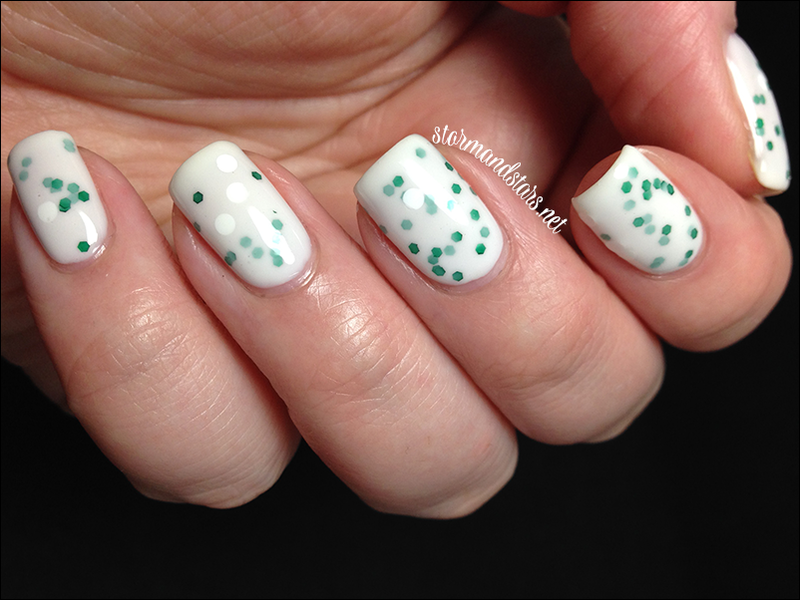 Eggceleration is a white crelly based lacquer absolutely loaded with green hexes and white circles. 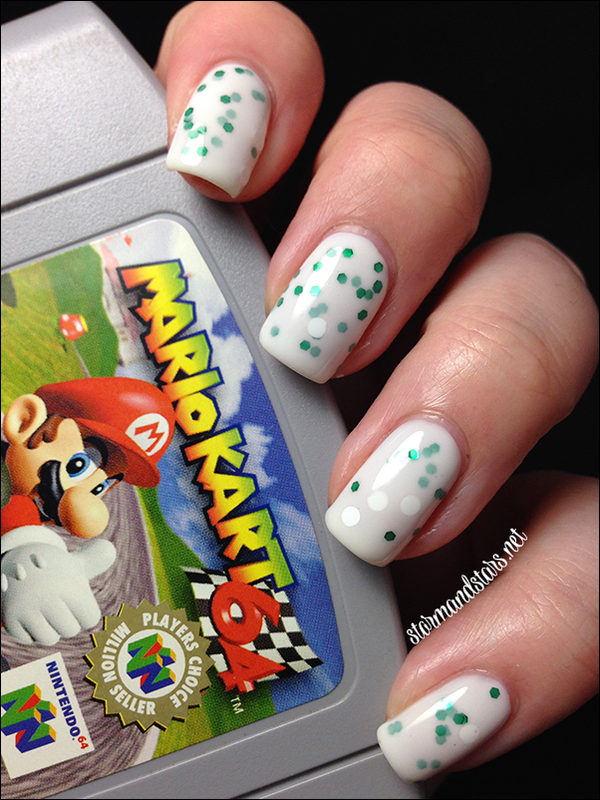 This lacquer is inspired by one of my favorite characters, Yoshi! I used two coats of Eggceleration over a base of Jolie Polish White Crelly, then I added a coat of Fat Lacquers Drive Thru topcoat to finish it off. The formula was good, though I did have to do a fair amount of digging for the white circles. This is a perfect representation of Yoshi, absolutely love it! Getting a little girly, here is Damsel In 'Dis Dress. Damsel In 'Dis Dress is a very light peach colored crelly base full of pink and neon yellow micro glitters. 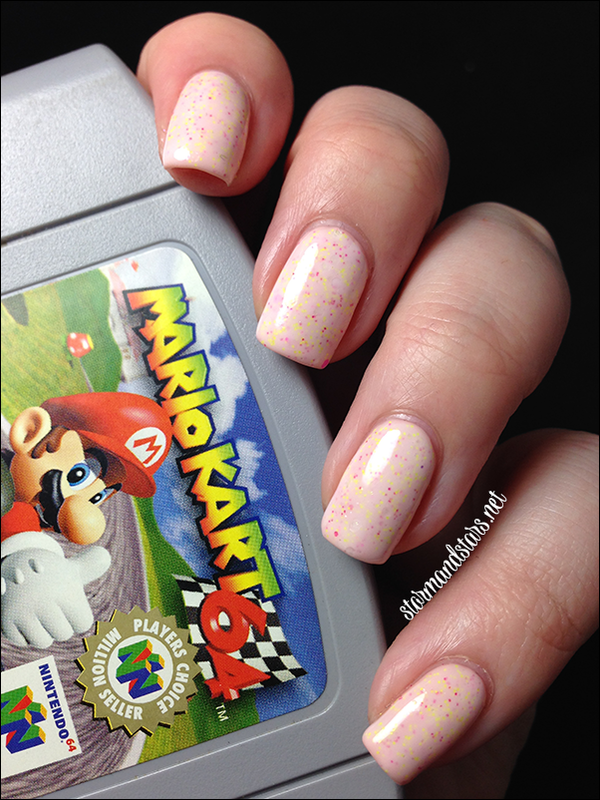 This pretty lacquer is inspired by none other than Princess Peach. 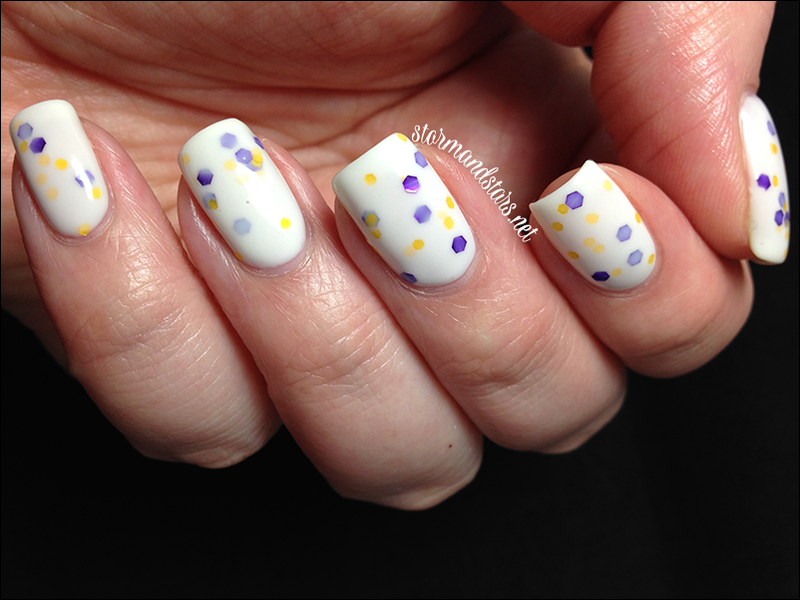 I used two coats of Damsel In 'Dis Dress over a base of Cult Nails Evolution for this look. I added a thick coat of topcoat to smooth it all out. The formula was a little hard to work with, but use thin coats and a light hand and it should be fine. Coming at you next is Psiloslidin. Psiloslidin is a white crelly lacquer with different red glitters throughout including squares and hexes and even some huge circles. 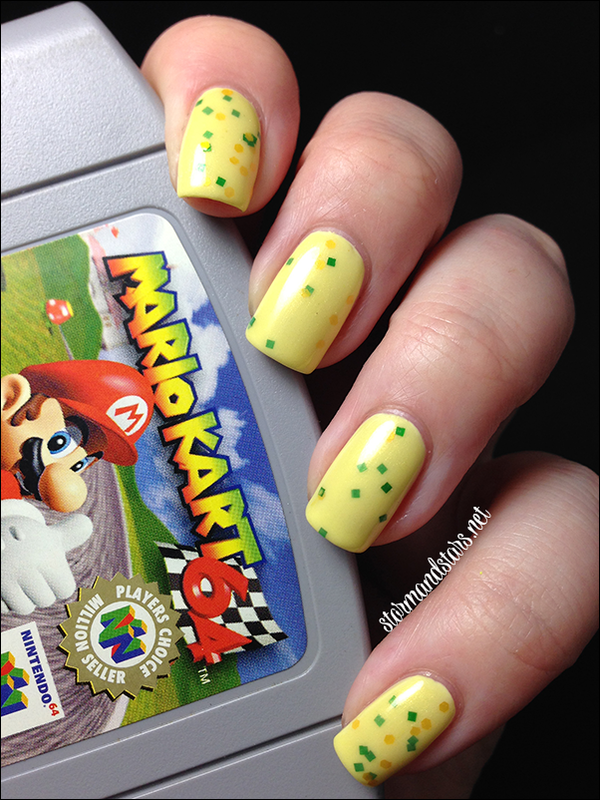 This glittery polish is inspired by Toad! 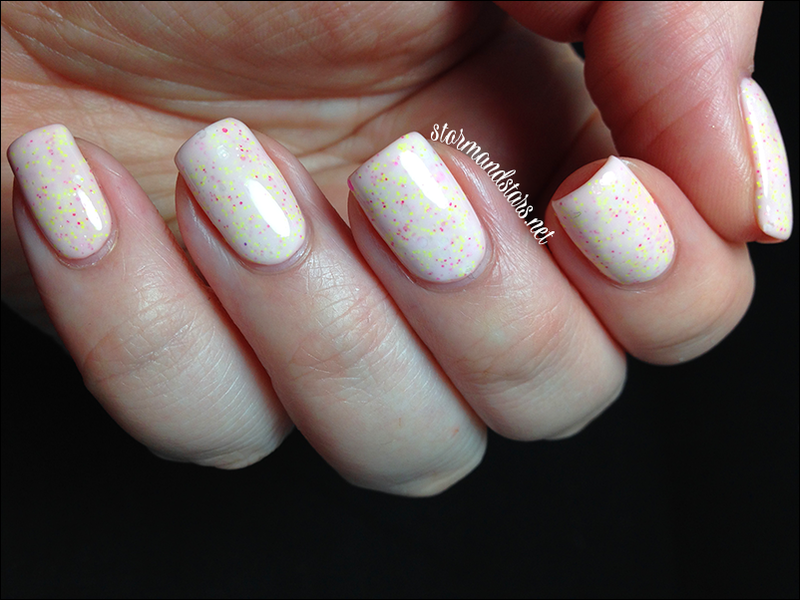 I layered two coats of Psiloslidin' over a base of Jolie Polish White Crelly. 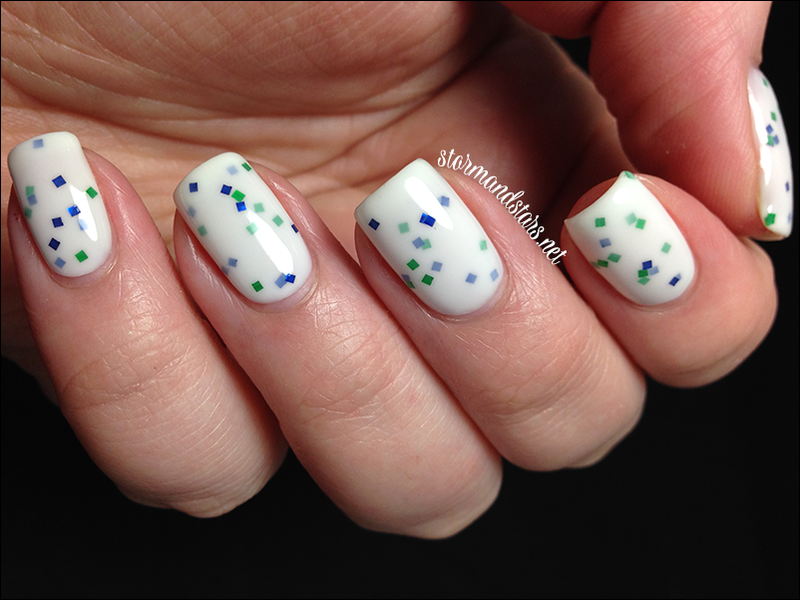 The whole mani was topped with a shiny topcoat to pull it all together. The formula was really good, but I did have trouble getting out the big circles, nothing a good shake and maybe a toothpick can't handle though! I love the monotone look of this and can see it working in a lot of seasons! Are you ready for some glitter? Here is Rainbow Rage. 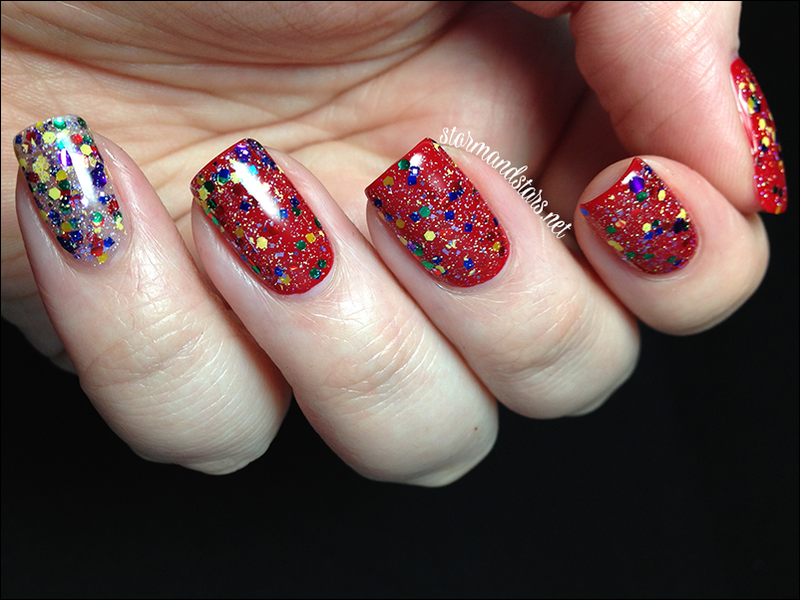 Rainbow Rage is the only clear based glitter lacquer in the collection. This baby is loaded with sparkly holographic glitters and all different colors of opaque hexes. The inspiration for Rainbow Rage is the Rainbow Road track. For all but my pinkie I layered one coat of Rainbow Rage over Cult Nails Kiss, plus topcoat. For my pinkie I did three coats alone plus topcoat to show how opaque it gets. The formula was really great! 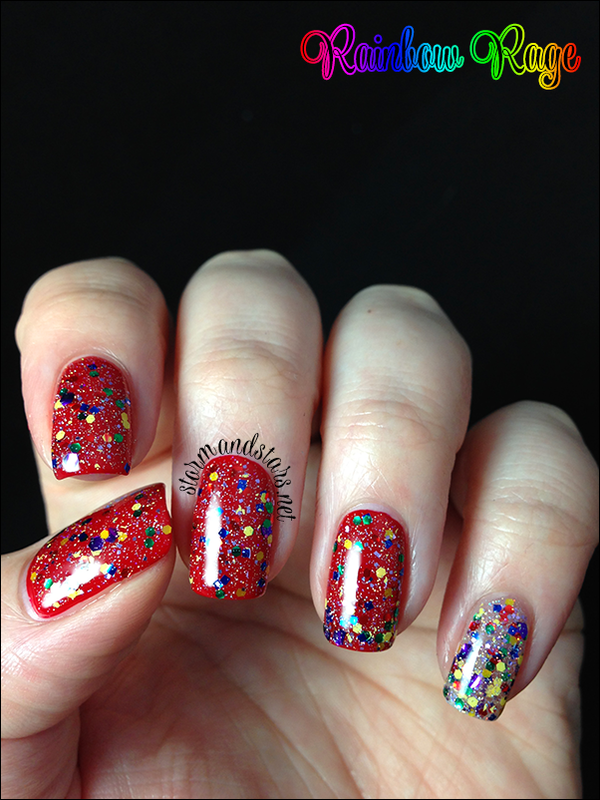 This topper is absolutely LOADED with glitters! I only wish I could capture how much it sparkles in these photos! Last up tonight is the namesake of this collection, It's A Me! It's A Me is inspired by the title character, Mario. 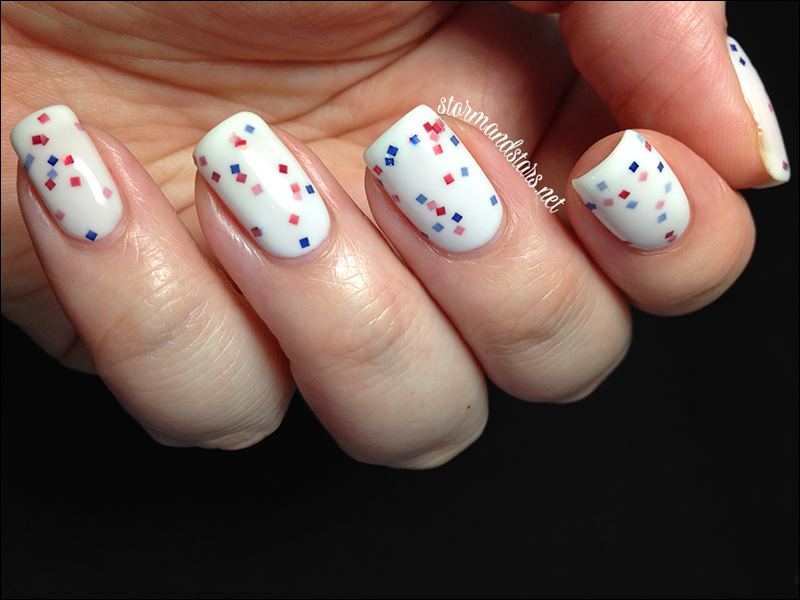 This is the last of the white crelly based lacquers in the collection and is filled with red and blue square glitters. 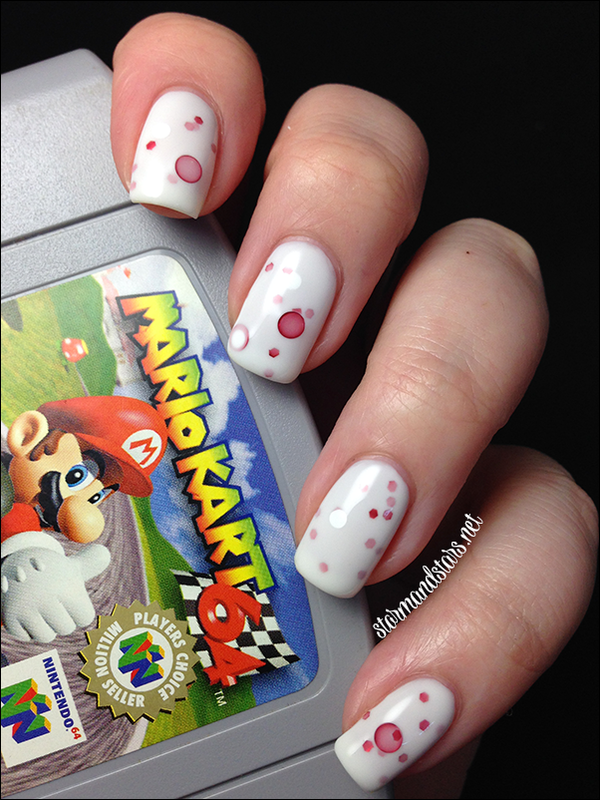 I layered two coats of Its A Me over a base of Jolie Polish White Crelly. I topped it all with a coat of Drive Thru topcoat. The formula was great and it smoothed out really well. 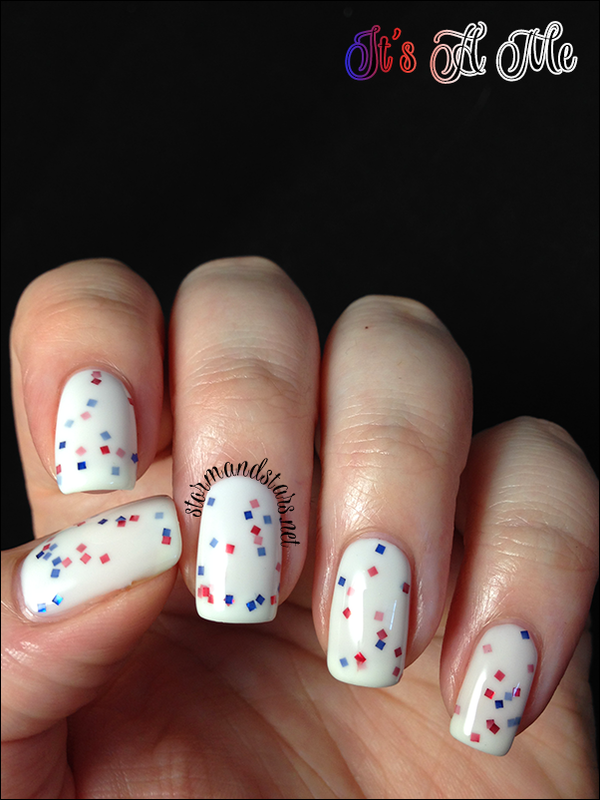 I love this simple glitter lacquer and am already plotting some 4th of July nails with it! 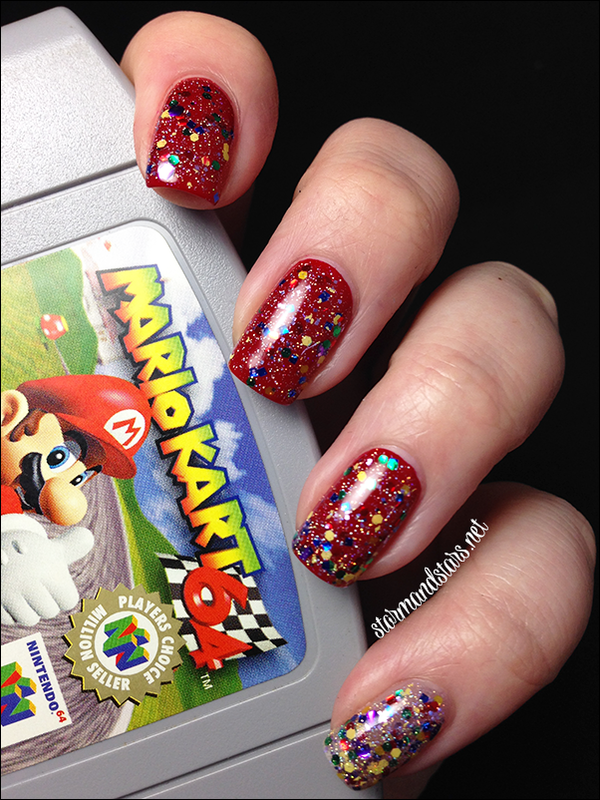 So what did you think of the Gamer Gloss Mario Kart collection? If you love white crelly based lacquers you will love this collection and there are some other great lacquers here too. You can purchase Gamer Gloss in their shop HERE. To keep up with new collections be sure to follow Gamer Gloss on Instagram and Facebook as well!